Urban growth in the United States is happening on productive soils that once were or could be farmland. Storing Carbon in Soil: Why and How? Boosting a soil's capacity to store carbon could increase crop productivity and improve environmental quality. Archived Web Extras are now available online! 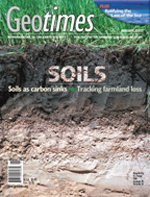 Read past weekly news items in the geosciences. The American Geological Institute's Government Affairs Program has been informing earth scientists on science policy for 10 years. The U.S. Geological Service is trying to bridge the gap between science and society. A real-time system for monitoring water quality could mean an early warning of water contamination. ON THE COVER: A permanent grass cover established under the Conservation Reserve Program resulted in sequestration of large amounts of carbon in this northern Minnesota soil. The dark area in this soil profile is very rich in carbon. Read story here. 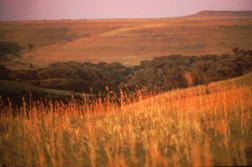 Photo courtesy of the United States Department of Agriculture.